1893 '40 PARAS' on GB QV Jubilee ½d vermilion ~ 'the Constantinople provisional' ~ a fine unused copy showing the broken 'S' with some original gum. 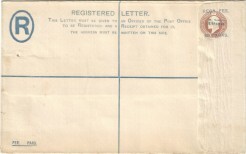 This example was sent via the UPU as a 'specimen' to the Royal Swedish General Post Office. 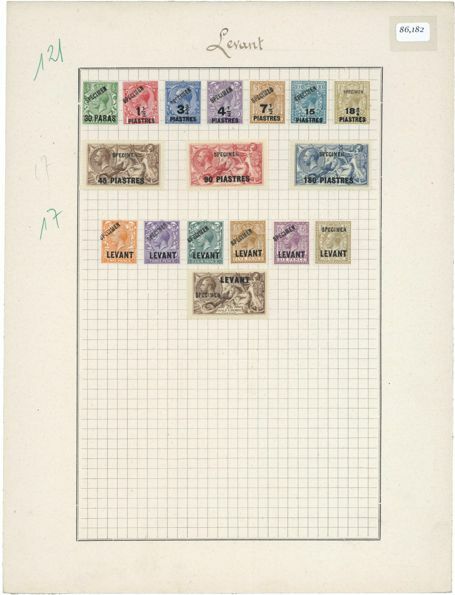 Unused copies of this stamp are extremely scarce and under-catalogued. 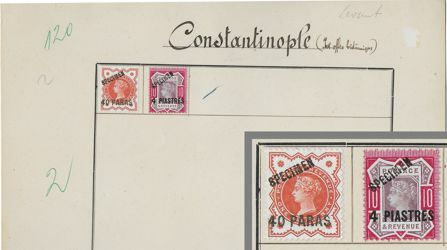 Album page, headed 'Constantinople (Post Office Britannique)' and numbered '120' in green at top left, from the Tunisia Post Office archive, bearing 1893 Provisional '40 PARAS' on GB QV Jubilee ½d vermilion and 1896 '4 PIASTRES' on GB QV Jubilee 10d dull purple & carmine, each handstamped SPECIMEN type TUN1 in semi-bold sans-serif caps (12.8×2.6mm) applied by the Tunisian Receiving Authority. This is the only recordrd example of the Constantinople Provisionalwith any form of specimen marking. Album page, headed 'Bureaux du Levant' and numbered '119' in green, from Tunisia Post Office archive, bearing 22 stamps - 1902-05 80pa on 5d, 4pi on 10d and 12pi on 2s6d (SG9-11) and 1909 (OR...1911-13) 5pi on 1s (SG21), each overprinted SPECIMEN (Samuel Type GB17), with 1902-05 40pa on 2½d (SG8), 1909 set 30pa on 1½d to 2pi20pa on 6d (SG16-20), 1910 set 1¼pi on 3d to 2½pi on 6d (SG22-24), 1913-14 30pa on 1½d to 4pi on 10d (SG35-39), and 1911-13 'LEVANT' re-drawn ½d & 1d (SG L14-15) and Sideface ½d & 1d (SG L16-17) - each handstamped SPECIMEN in semi-bold sans-serif caps (12.8×2.6mm) - applied by the Tunisian Receiving Authority, with manuscript annotations '23' in left margin. BPA cert (2015). 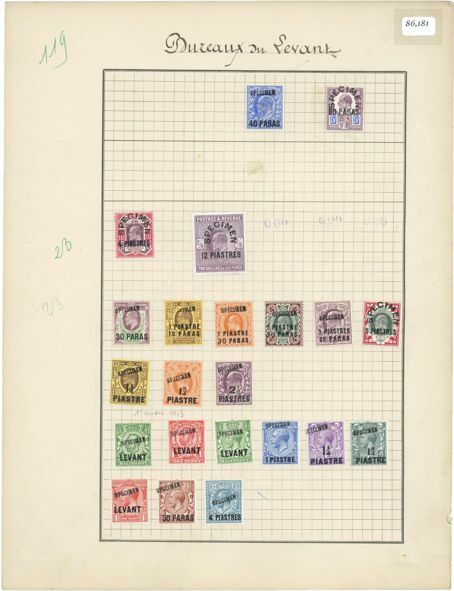 Album page, headed 'Levant' and numbered '121' in green, from Tunisia Post Office archive, bearing 17 stamps - 1921 30pa on ½d to 15pi on 10d (SG41-46) and 'LEVANT' only 1921 2d to 6d (SG L18-L22) - each handstamped SPECIMEN in semi-bold sans-serif caps (12.8×2.6mm) - applied by the Tunisian Receiving Authority, with 1921 18¾pi on 1s optd SPECIMEN (Samuel Type GB23), 1921 B.W. Seahorse set 45pi on 2s6d to 180pi on 10s (SG48-50) and LEVANT only 2s6d (SG L24), each optd SPECIMEN (Samuel Type GB26), with manuscript annotations '17' in left margin. BPA cert (2015).